A front of house re-work features a reconfigurable desk and display unit that echoes the striking herringbone floor. West Space, one of Melbourne’s leading contemporary art spaces, wanted to renew their existing front and back of house areas – to extend the ways that the organisation could support their exhibiting artists, staff, and community. In addition to providing a variety of office, meeting and event spaces, the design also creates informal meeting and working areas within the front of house space. We wanted to consider how the architectural identity of West Space could be considered separately to the space it occupies. After-all, its current location in Melbourne’s Bourke Street is the latest of three homes for the Artist Run Initiative that began 7km to the West of the CBD in Footscray. The central question that arose from discussions with the client was how could the design support the creative community of West Space? 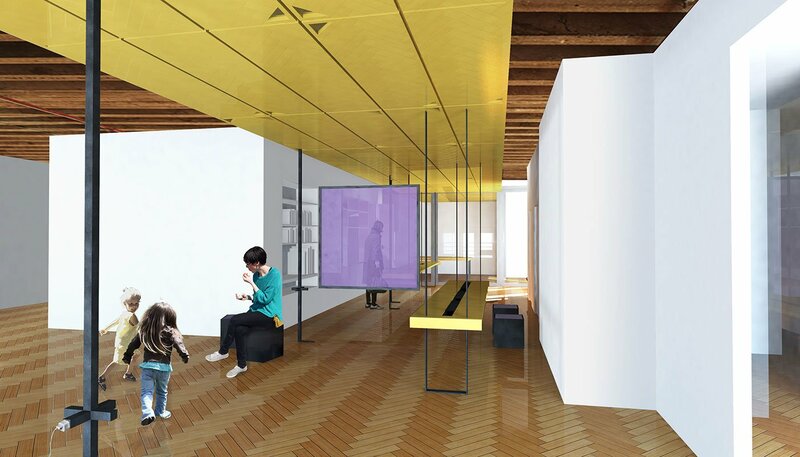 How could it provide activity based workspaces for its employees, support the groups that use the gallery for presentations, film screenings and book readings, provide facilities for exhibiting artists to meet and work. 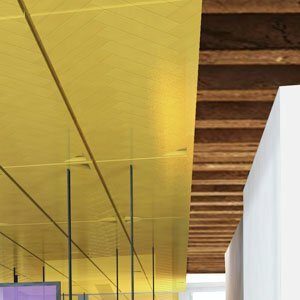 Given the natural funding constraints and to provide for a future that may elsewhere, our idea was to develop a rich architectural response from something that, in a very ordinary way, provides flexibility and consistency across many thousands of locations: the suspended ceiling grid. Customising this off-the-shelf system into a spine of gold anodised aluminium panels, we developed a design that suspends not only lights, services, data and power cables, but also the work surfaces themselves. A fragment made from fragments: exhibiting art within libraries using on the idea of a distributed gallery, made from a kit of parts. A circle around a fire remembered as a brass table top, a surface gathering the marks of all who sit there. 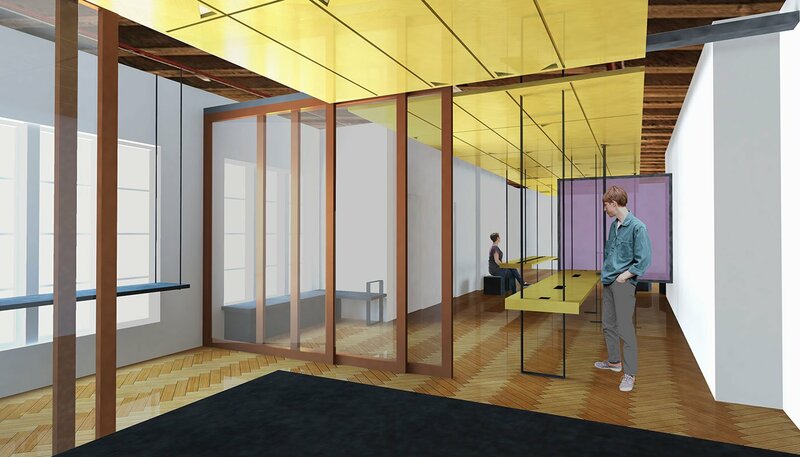 A light filled contemporary office space for fifty staff with strong connections to the built fabric of the existing building. A dedicated display space for NGV’s Asian collection designed in collaboration with NGV under curatorial guidance. An experimental gallery space for NGV at Federation Square for the display of emerging local artists with an emphasis on street art and youth culture. In keeping with the eclectic nature of the brand, this fitout incorporates the original building fabric along with a mix of fabrics, mirrors and merchandise. A state of the art virtual reality facility, ovoid in shape, with the curved projection screen at one end the control console the other. Conceived as an imaginary landscape trapped inside the exiting building, this fitout allows is the greening of a sparse interior with virtual courtyards. An artist run gallery space with a ‘rustic’ room to the front placed in deliberate opposition to the ‘white’ room to the rear. Drawing the gaze downwards, into the scale of the forest floor. A glowing shed and a timber box: this extension of the Old Shire Offices in Viewbank combines these elements to create a simple, flexible facility.